Hercules Fence will help you find the right fence for your needs. Are you thinking about buying a fence for your property? There are plenty of styles available to choose from today. Examples of such include aluminum, wood, vinyl, chain link, electric, and PVC. There is a fence type for every kind of homeowner. 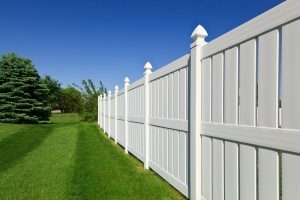 However, if you are struggling to choose the right fence for your property, here are important considerations to help you make the right decision. Before you purchase your fence, you must check with your areas HOA. You don’t want to invest lots of money into a fence and later find out that it is not permitted. Be sure to do your diligence and check before you break any rules. This could save you a lot of headaches down the road. Is security important to you? If it is, consider investing in a security fence! Popular types of security fences include palisade fencing and chain link or mesh fencing. Security fences are popular choices for families with young children. Before you invest in a fence for your property, you must consider the maintenance it will require over the years. This is where many homeowners go wrong. For example, a standard wood fence may need to be repainted/re-stained over the years. If you know that this is not something you will want to do yourself or have to pay someone for, you are probably better off choosing a different fencing material. Did you know that some styles of fences possess soundproofing abilities? If you live in a busy area, this may be something you want to consider. For example, if you live in the city and have a lot of traffic next to your home, a quality noise-barrier fence may be an excellent investment for you. If you live out in the country where it tends to be much quieter, sound-proofing may not be nearly as important to you. No matter what type of fence you have decided on, Hercules Fences has the expertise and equipment to construct your dream fence. Our experienced team can help meet your fencing needs, whether they are residential or commercial, for the right price. Give us a call at 804-752-7992 or visit usonline. To see examples of our work and keep in touch, don’t forget to follow us on Facebook, Twitter, Google+, LinkedIn,Flickr, and Pinterest. This entry was posted on Friday, July 13th, 2018 at 10:37 am. Both comments and pings are currently closed.